IONTOX’s cell viability screen (ATP), FastTox™, was developed to key information on compound toxicity early in the drug discovery process. The ability to understand how compound toxicity changes as chemistry changes can provide a competitive edge by allowing optimization of drug attributes while reducing compound liabilities. New chemical entities can be rapidly be compared to reference compounds and to one another thereby enabling pharmaceutical companies to rank-order compounds based on general toxicity. FastTox™ will give your organization the data you need to make informed decisions early in the drug development process. In the ﬁgure to the left, human kidney (HK-2) cells were seeded into a 96-well plate and then exposed to 7 different analogs of the same template drug. After a 24 hr incubation period at 370C with 5% CO2 the media was aspirated off and the cells analyzed for adenosine triphosphate (ATP) levels. Values are expressed as a percent (%) viability relative to vehicle controls. The concentration response curve for each compound was compared to the reference drug (Positive controls-blue) and the negative drug control (orange). The goal was to ascertain which compounds showed more toxicity than the reference drug. In this way it was possible to determine how changes in chemistry affected toxicity. 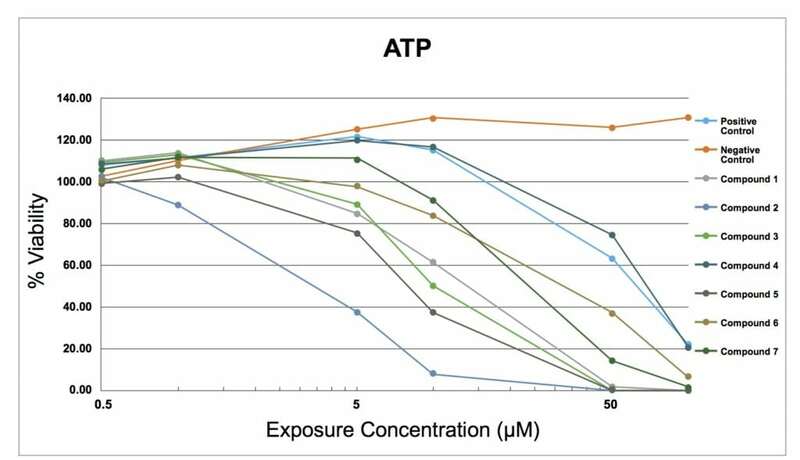 The FastTox™ screening consists of running an Adenosine triphosphate (ATP) quantiﬁcation assay at a single time-point, with 3 technical replicates, using HepG2 or H4IIE cells, at six concentrations. The sponsor provides the test material as a 10mM stock solution in DMSO. Expected turnaround time for up to 100 compounds is less than one week.